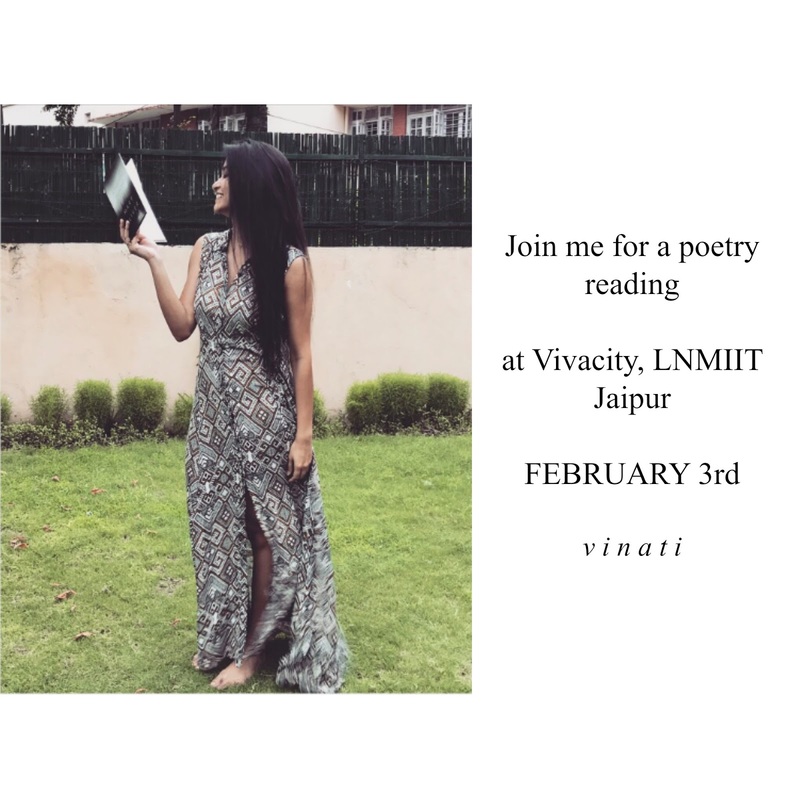 If you are in Jaipur tomorrow, let's hang out together for a while under the winter sky and a bonfire night with beautiful poetry to keep us warm and cozy. It will be like our own little version of dead poets society. My first book is out and I cannot keep calm! After months and months of burning the midnight oil, I'm super stoked to share that Udaari is now available worldwide on Amazon. It is almost unbelievable, something which started as a hobby, an outlet for a deranged teenager turned out to be a whole new level of life. I'm so soo grateful for every blessing I've received. There are not enough words to share my ecstasy and gratitude for everything that has happened to me. I'm just glad I did not stop. So here I am, with my first collection of poems Udaari. You can buy your copy from http://writingsofvinati.com/shop/. I'm sending out limited signed copies from Amazon India. Get yours before they are sold out. There are so many things that have changed over the years but this comfort that I feel every time I open my dashboard is still the same. I hope you continue to support me and be my backbone. 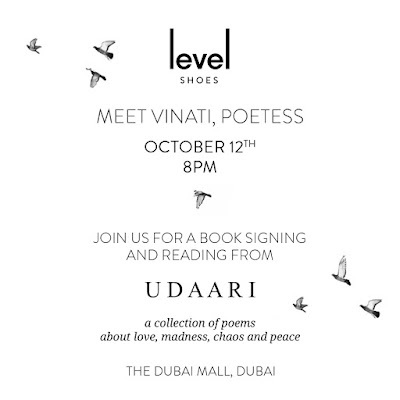 The launch of my maiden collection of poetry, Udaari is scheduled at a beautiful event organized by Level Shoes at their in-store Cafe Vogue on October 12, 2017. 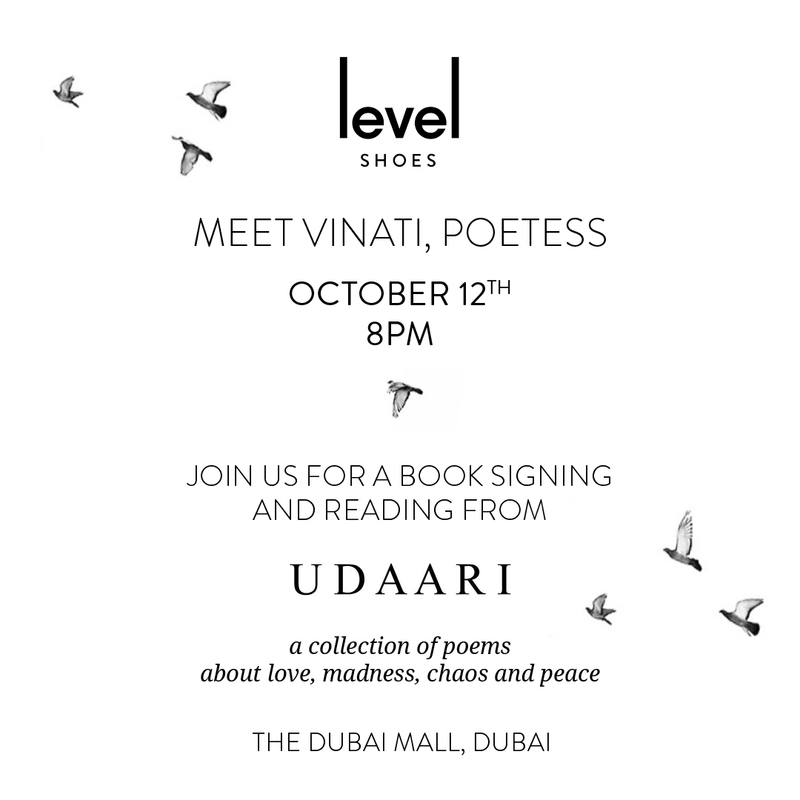 If you’re in Dubai and chilling nearby, drop in to say hello. The launch will be followed by poetry reading and book signing session. We’ll be having limited copies of Udaari and a special little gift for you all. The event is open for everyone. No pre booking, just come, meet me there and be my backbone guyssss. I've got a big news to share and it's been a while since we talked or I blabbered and you listened patiently. I know you missed me (say yes) and I missed this place too. But no wasting of time in telling that to each other because we know that we mean it. So the news is. ohmygodicant'tbreathe. I AM PUBLISHING A BOOK!!! see the flock of birds? they remind me of this place. 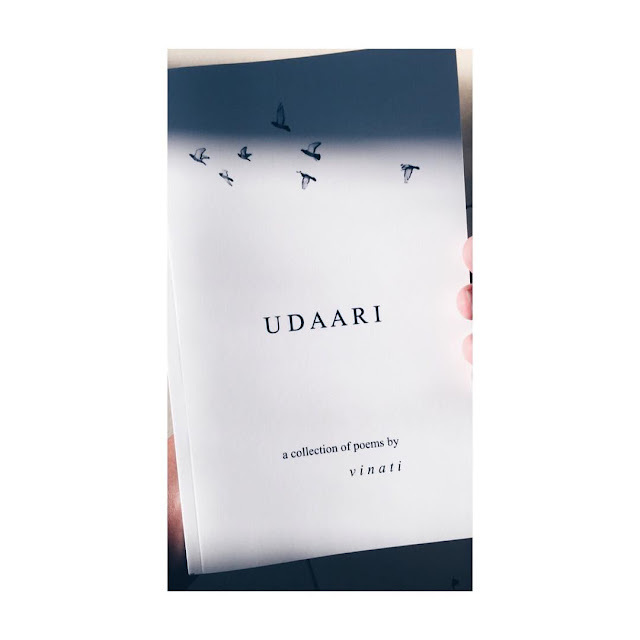 My first collection of poems, Udaari is coming out soon, most probably by the end of next month and I am absolutely thrilled and excited and ecstatic and hyperventilating a little too much. I've been doing so many things, like gazillion things simultaneously. But not complaining at all because however daunting this process may be, I'm thoroughly enjoying this super crazy ride. Udaari is a word taken from my native language Punjabi. 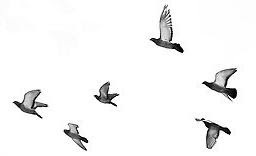 Udaari means to fly, to spread the wings and take a leap, a quiet soar against the wind. Let me know what you think about the name and the cover design. I'd be happy to hear some reviews. And talking of reviews, if any of my blogger friend who still reads me, loves me and would like to write a review of my first book, let me know and I'd be happy to send you an advance reader copy. Spread the word friends and help me get famous. In other news, I've also designed a whole new website because I'm trying my best to learn how to be a professional author and many more important things in between. That's a lot of work too by the way. 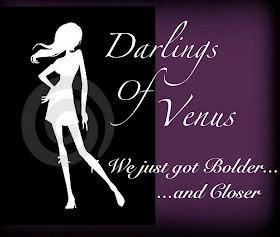 Check out www.writingsofvinati.com and join my mailing list, okay. Also, I think many of you don't know that I'm super active on my Instagram page and Facebook page. Drop by sometime. I'll be sharing more updates about this project soon. A book launch is also scheduled but more on that later. For now, let's just allow this news to sink in, that it is all happening. Udaari is happening, for real. yet clawing their way to the paper. 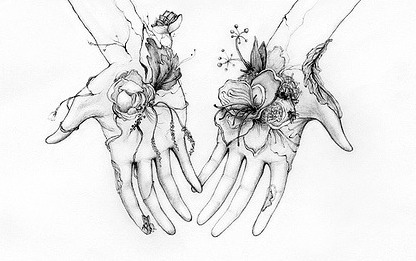 when i show you my wounds. to cross the rough seas. mercilessly on a tuesday afternoon. The things i speak in hushed tones in the middle of the day. today. i unapologetically choose me. how is your day going love?